Located inside Chengdu Cultural Park, Shufeng Yayun Teahouse has been hosting Sichuan Opera performances for over 100 years. It’s one of the city’s most popular venues for this art form, which involves an exciting mix of music, dancing, acrobatics, martial arts, hand shadows, puppet play, comedic theater, sword play, and costume changes (face changing). At the historic Shufeng Yayun Teahouse’s nightly performance, you can upgrade to premium seats for better views of the stage and enjoy the performance with lights snacks and tea, in addition to a massage or ear grooming. Book your tickets ahead of time for convenience, or combine a show with a hot-pot dinner and transportation for a complete experience. Be sure to arrive early to watch the performers applying their elaborate makeup and colorful costumes. Shufeng Yayun Teahouse is a must for first-time visitors to Chengdu. The performances are suitable for families, including children. Dress appropriately for the season as the performances are held in an outdoor theater. Shufeng Yayun Teahouse is located inside Chengdu Cultural Park on Qintai Road. It’s easiest to take a taxi there. By public transportation, take bus 25, 46, or 103. Performances are held every night at 8pm and last for around 90 minutes. Arrive early to see performers putting on their elaborate costumes and makeup. The performances are outdoors, so it’s best to attend a performance when the weather is pleasant. One of the most amazing acts during a Sichuan Opera performance is face changing, where the performer rapidly changes masks. There are three main types of face-mask-change routines: wiping mask (where applied makeup is wiped off to change the face), blowing mask (where the actor blows on powder cosmetics to change the face), and pulling mask (where different masks are lightly pasted on the face and whisked away quickly one by one). 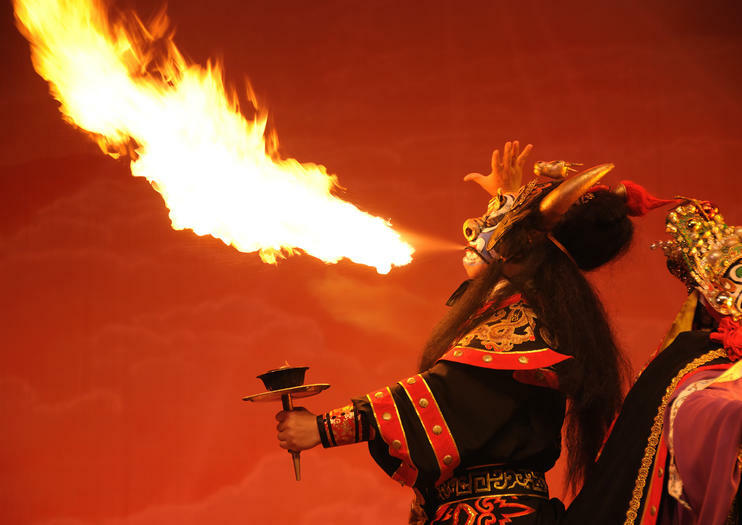 Immerse yourself in the captivating culture of Chengdu during an incredible Sichuan Opera show and traditional dinner. Depart from your hotel in a luxurious, air-conditioned coach and venture within a traditional restaurant to devour the local delicacy of Sichuan hot-pot. Sated, prepare to feast your eyes upon a colorful spectacle of acrobatics, music and comedy as you watch the extravagant Sichuan opera from a seat in a prime position. Enjoy a one-of-a-kind cultural excursion, and learn more about Sichuan’s traditions, when you book to attend an evening of Sichuan Opera. Make your own way to the Shufen Yayung Theater (or upgrade for private, round-trip transit from your hotel), and get ready to take in the show. Sichuan opera consists of numerous elements, from live music and dance to elaborate costumes, acrobatics, and more. Enjoy the wide-ranging show before returning to your hotel. Gastronomy and Performing Arts are extremely important in Sichuan province, and with this tour you will be able to experience the best of both. First you will try some of Chengdu’s most well known snacks, all of them may seem exotic to those unfamiliar to the area. Second, you will be able to enjoy a Sichuan opera, renowned by the Changing Faces and Rolling Light acts. Enjoy a combination of performing arts and food for a cultural evening out in Chengdu. This 4-hour experience includes a hot pot dinner, a Sichuan specialty where you'll make your own soup by simmering the ingredients of your choice, followed by a showing of the Sichuan opera. Hotel transfers are included to provide you with a convenient night. Make the most of a private guide and flexible itinerary, tailored to your interests, on this full-day tour of Chengdu, including lunch and transport (optional). Stroll along lively Kuan-Zhai Lane, browse the markets and shopping centers, then relax in a traditional teahouse in People’s Park or tuck into Chengdu’s famous hot pot at a local restaurant. Alternatively, escape the city for a tour of Mt Mengding, marvel over the world’s largest Buddha in Leshan or see adorable Giant Pandas at the Chengdu Panda Base. It’s up to you! Cross Chengdu’s must-see attractions off your list with this private 8-hour tour that takes you to the Panda Breeding Center, Wenshu Monastery, and People’s Park. Learn about each attraction from your guide as you travel with the ease of personal transportation. Visit Chengdu’s Research Base of Giant Panda Breeding to see China’s iconic giant pandas at work and play. With convenient transportation from your hotel, you maximize your time touring the facility with a guide. Witness the pandas eating and playing in a habitat that closely resembles nature, and experience the respect the center has for these protected animals. Squeeze all the highlights of Chengdu, the Sichuan capital, into a 9-hour guided tour. This tour includes the chance to watch a traditional Sichuan opera in a classic Chinese teahouse, take a walk down bustling Jinli Street, and learn about panda conservation at the Panda Base. Hot pot lunch and round-trip hotel transportation included.